PHILADELPHIA — Many readers are likely to associate Edgar Allen Poe with a story like “The Tell-Tale Heart” or a poem such as “The Raven.” But in 1848 Poe also wrote Eureka, a lesser-known work in which the author develops an intuitive rather than scientific argument about the nature of the universe. In the book, he presents ideas reminiscent of two major twentieth-century theories, the “Big Bang” and relativity. Even so, scientists don’t take this work too seriously. For Jane Irish, Eureka provides license to create images with hallucinatory power. 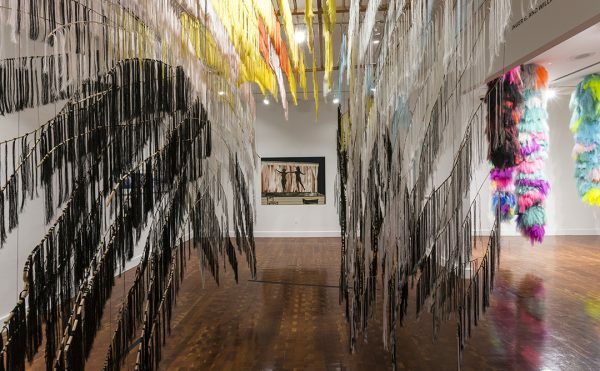 The work in her current show, A Rapid Whirling at the Heel, reimagines the role of Renaissance ceiling paintings and insists that art can be simultaneously beautiful and political. 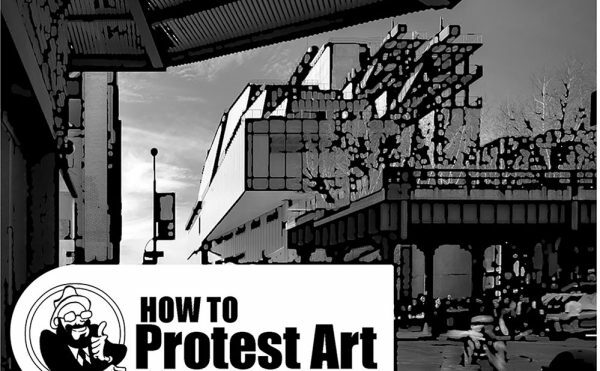 The juxtaposition of Rococo style with anti-war demonstrators subverts viewers’ expectations. 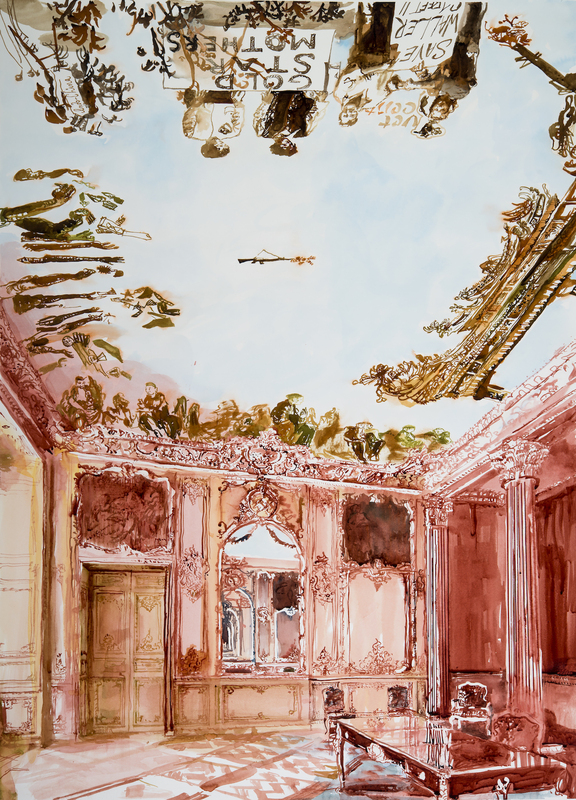 “Resistance Ceiling Red and Blue” (2015), a work in ink on paper, for instance, presents a mansion in ruins, but upon closer inspection, the chandelier has been replaced by a machine gun. 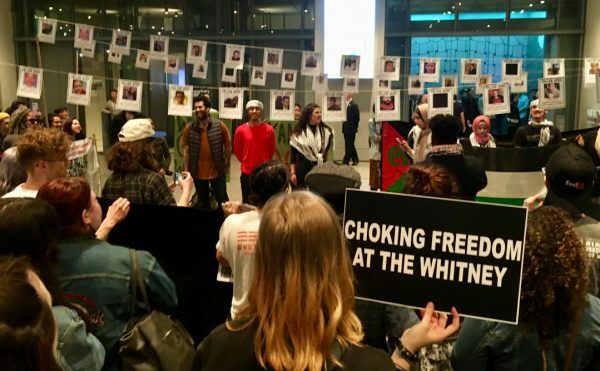 Groups of protestors line the perimeter of the ceiling, including two figures holding a sign that reads “Gold Star Mothers,” an organization that was initially formed by mothers who had lost sons or daughters in WWI. Unlike figures in Renaissance ceilings that are always at a far remove from our earthly plane, Irish’s protestors seem as if they will step down from the ceiling any minute, as if they are pressing against glass. The sky above them appears far away. 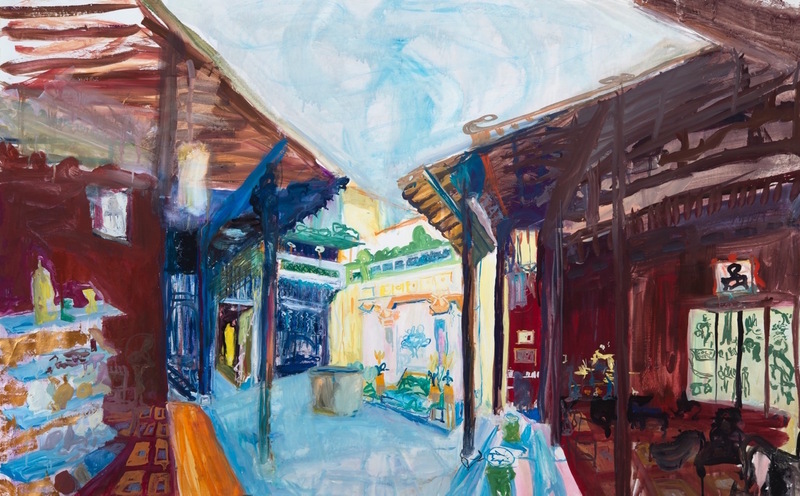 It’s easy to get caught up in the complex interiors that Irish depicts in her paintings and drawings, but she also subtly calls attention to Vietnamese landscape. However, Irish forces us to view the landscape through the windows of these Rococo houses. The architecture distances the viewer from the landscape. In other words, the remnants of French colonialism usurp experience of the landscape. Irish also contrasts the feel of dreams remembered more for tone than action with the supposed clarity of waking life. “House of Tan Ky Study” (2015), in gouache on Tyvek, has the air of the dream. On the right side hangs a picture frame with an outline of a person’s head and shoulders. The outline looks like a crude rendition of a Chinese character. With this detail, Irish subtly acknowledges China’s heavy cultural influence in Vietnam throughout history. 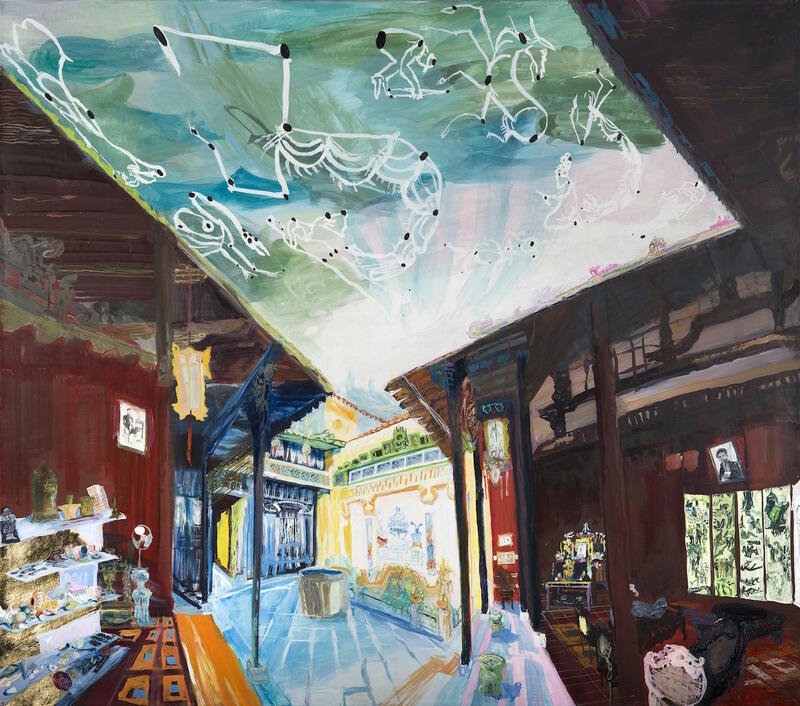 While the majority of details in “House of Tan Ky Study” are blurry and dreamlike, the objects in “House of Tan Ky” (2015), painted with tempera on linen, are more sharply defined. The picture frame now contains a portrait and on the left side of the painting there is a fan next to a bookshelf with a variety of knickknacks. But more significantly, the architecture of this 18th-century merchant’s house in the commercial port city of Hoi An shows signs of Chinese and Japanese influence while the interior decoration bears the marks of Europe. Here let the reader pause with me for a moment in contemplation of the miraculous, of the ineffable, of the altogether unimaginable complexity of relation involved in the fact that each atom attracts every other atom; involved merely in this fact of the attraction, without reference to the law or mode in which attraction is manifested; involved merely in the fact that atom attracts every other atom at all, in a wilderness of atoms so numerous that those which go to the composition of a cannonball exceed, probably, in mere point of number, all the stars which go to the constitution of the universe. The atoms in Irish’s work are the markers of globalization, the Rococo rooms, the anti-war protestors, the presence of Chinese and Japanese influence, that seem to have been drawn together by enigmatic forces. But where Poe is rightly in awe of the universe’s composition, the forces Irish depicts aren’t mysterious. They are driven by humankind’s greed and deserve no reverence. “Cosmos” (2015), a triptych painted with tempera on canvas, unifies the various motifs in the show and is perhaps its most impressive work. The horizontal suspension from the ceiling breaks the routine of looking at work on the wall and urges viewers to consider the larger context of Irish’s images. The background consists of several dragons weaving through the clouds. The Vietnamese, according to their origin myth, are descendants of a dragon and a fairy. Over that background, Irish has painted small dream-like freeze frames with figures such as Lyndon Johnson, young men raising their fists in the Black Power salute, and returned war veterans. Irish’s work also suggests a contemporary origin myth, one that acknowledges the ways in which trade, colonialism, and imperialism have altered whole systems of thought. But unfortunately this myth is true, and it seems to be engulfing us all. 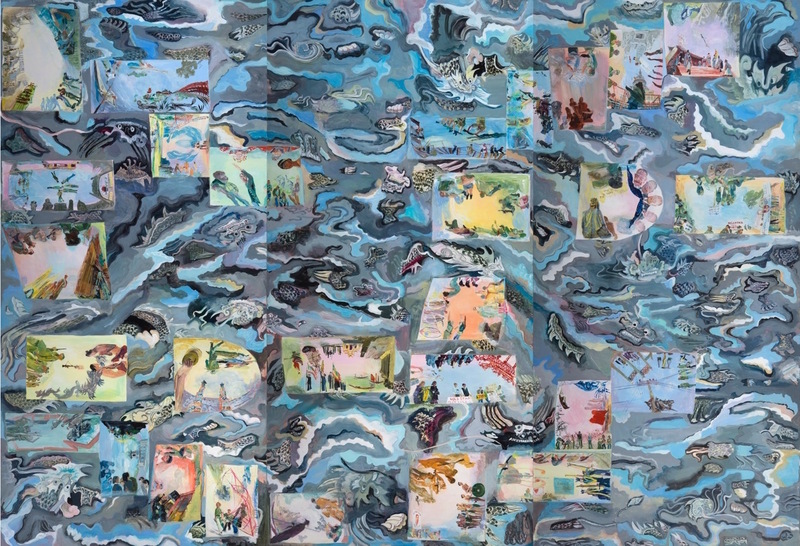 Jane Irish: A Rapid Whirling on the Heel continues at Locks Gallery (600 Washington Square South, Philadelphia, Pennsylvania) through May 31.